Fr. Leo Kosch was born in Columbus, NE. He is the 7th out of 9 children, and his parents still live in Columbus. His name is pronounced “Kush” as in “cushion.” Fr. Kosch attended St. Bonaventure grade school, Lakeview Public high school, UNL, and Mount Saint Mary’s Seminary in Emmitsburg, MD. He was ordained a priest in 1993. 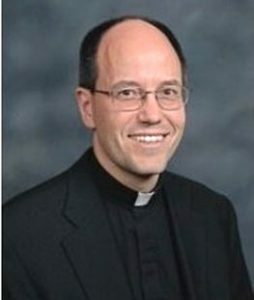 In his first 22 years as a priest, he always taught at one of the Diocesan high schools (Lincoln Pius X, Hastings St. Cecilia’s, David City Aquinas, Wahoo Neumann) as a religion instructor at various grade levels 7-12. He comes to us most recently from St. John Parish in Prague, NE. Fr. Kosch’s hobbies include reading, hiking, playing guitar, learning vocal music, doing little maintenance projects, visiting with his family and his fellow priests, and an occasional movie or Netflix. Fr. Lee Jirovsky grew up in Seward and attended UNL before entering St. Gregory the Great Seminary. 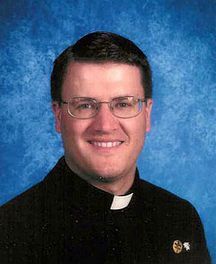 Ordained in 2006, he served in Plattsmouth, Lincoln, and Hastings as a priest, teacher, and administrator. After 4 years as Principal at St. Cecilia, he became the Assistant Chief Administrator Officer at Lincoln Pius X in 2015, under Fr. Meysenburg. He is in residence at Sacred Heart, helping with Sunday and Holy Day Masses and confessions.